Going through a divorce or other family law issue may be one of the most upsetting times of your life. Christopher D. Thomas understands your concerns. He advocates for clients in Honolulu, Hawaii, through cases that involve matters such as child custody and support. Additionally, his law office provides representation for criminal law and military law issues. No matter what your case entails, you can count on Mr. Thomas for the advice and counsel you need. As you are facing some of the most difficult decisions you may ever have to make, you need an attorney who keeps you informed of your options. Mr. Thomas is an effective communicator who ensures you know what the immediate and long-term consequences of a legal action may be. 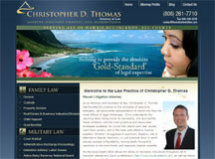 The law office of Christopher D. Thomas is known for its ability to find creative solutions for clients. Your case may require negotiating a settlement, or you may find that going to court is the best option. In either situation, Mr. Thomas has the experience and skills necessary to help you reach the best possible outcome.